Seeing the School of the Arts graduating senior, Kenny Cruz, is always a pleasure. Well mannered and cordial, Kenny greets the world with an easy smile. The other day — on time as usual — he joined me for a photo op at Cobb’s Hill. Those who follow local baseball know Kenny will be drafted in the MLB draft next weekend. With the help of his former coach, John Valle, Kenny has met with scouts and attended national showcases. Kenny anticipates being chosen anywhere from the 5th to the 15th round. Professional baseball is not Kenny’s only option. 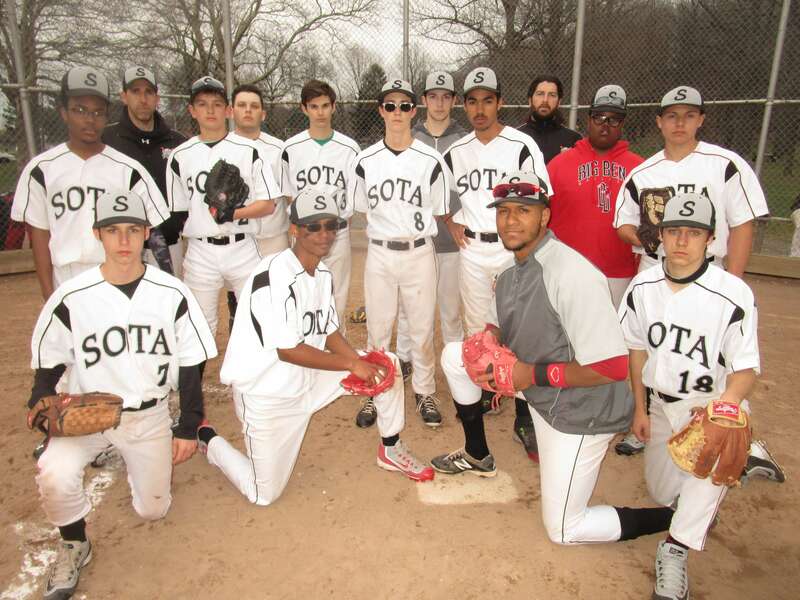 A fine student at SOTA — once having the highest GPA in the District — Kenny received a full scholarship to play baseball at Division I Rutgers University. 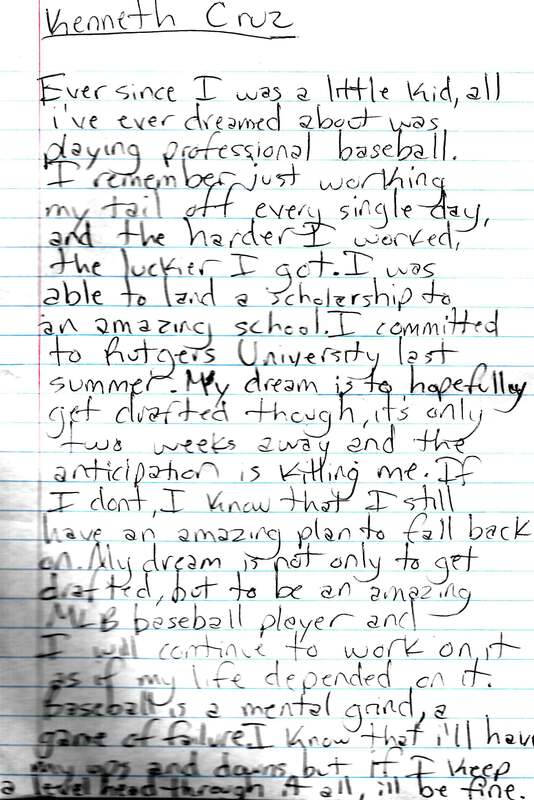 As seen in Kenny’s note on where he stands, the anticipation of the draft is “killing [him].” He’ll make his decisions after the draft, but right now the waiting game takes a lot of mental patience. As a senior, Kenny is done at SOTA around noon. 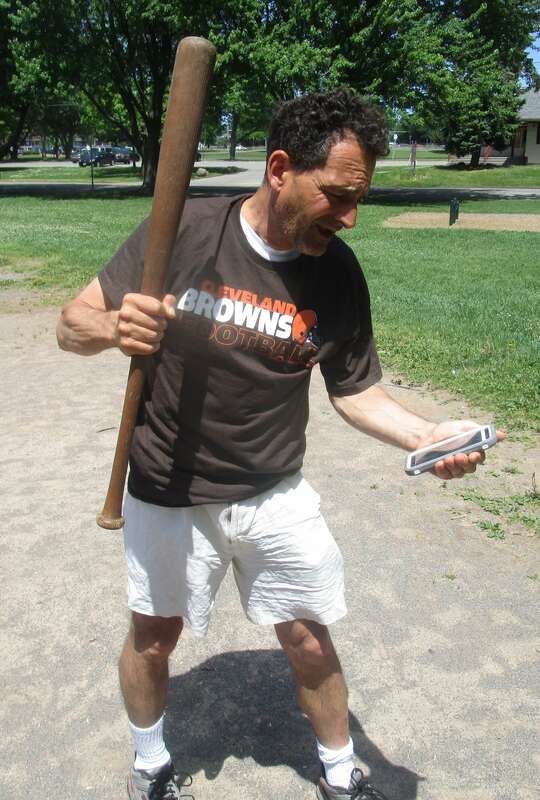 Partially as a distraction, Kenny often heads over to The Battery for batting practice. Next weekend can’t come soon enough. We’ll let you know how the draft goes. And Kenny promises another photo op at Cobb’s Hill: wearing the major league cap of the selecting team (all draftees get caps delivered to their homes). 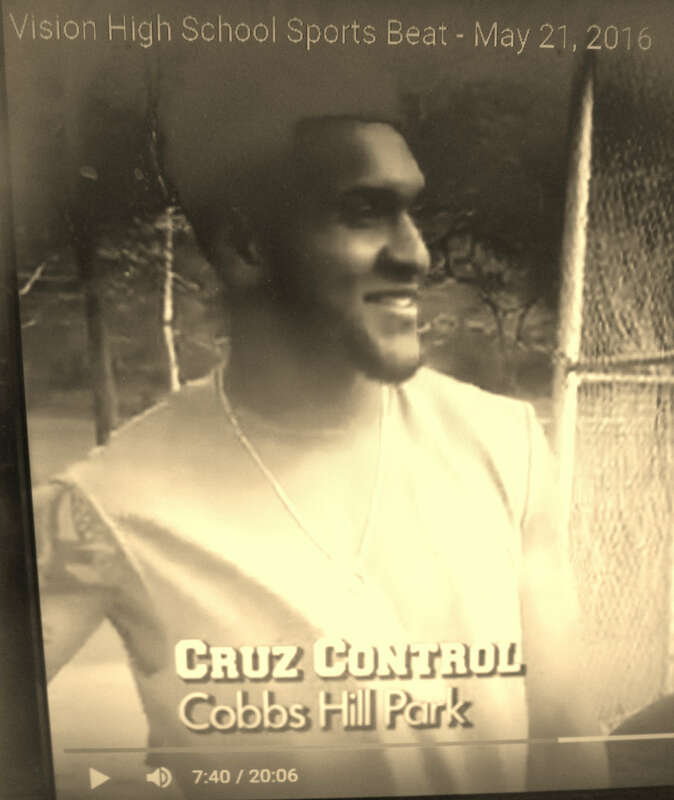 As seen in the pictures, earlier this season Kenny and I (representing the Town of Brighton in a McQuaid Jesuit High School pullover and cap) played a little ball at Cobb’s Hill before his game against Monroe. 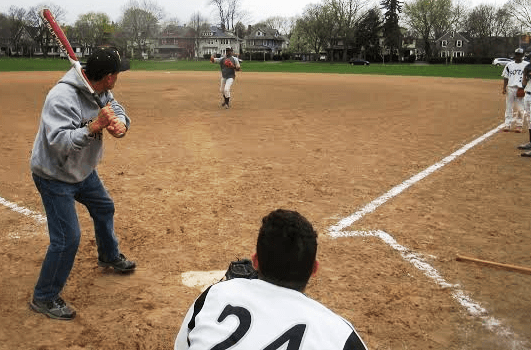 Kenny wisely didn’t bite on my low and away split-fingered fastball. As for my swing, I properly reimbursed the homeowner on the other side of Culver for the smashed window pane. Since a work-out at MCC a few years ago, we like to think we “discovered” Kenny. While we did write the first story on his successes (for a D & C blog), many knew of his skills. 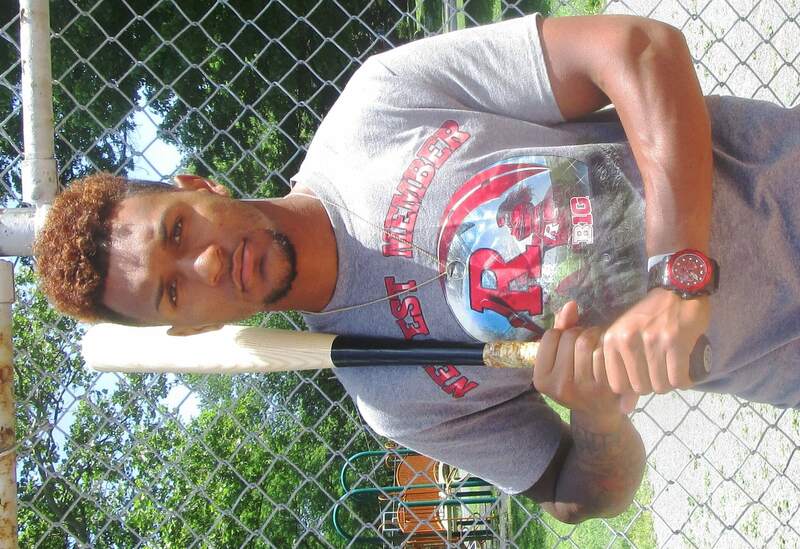 We’ve followed Kenny since, in USA Today as the highest ranked outfielder in NYS, and in the D & C for winning the RCAC player of the year award. One fact is indisputable. 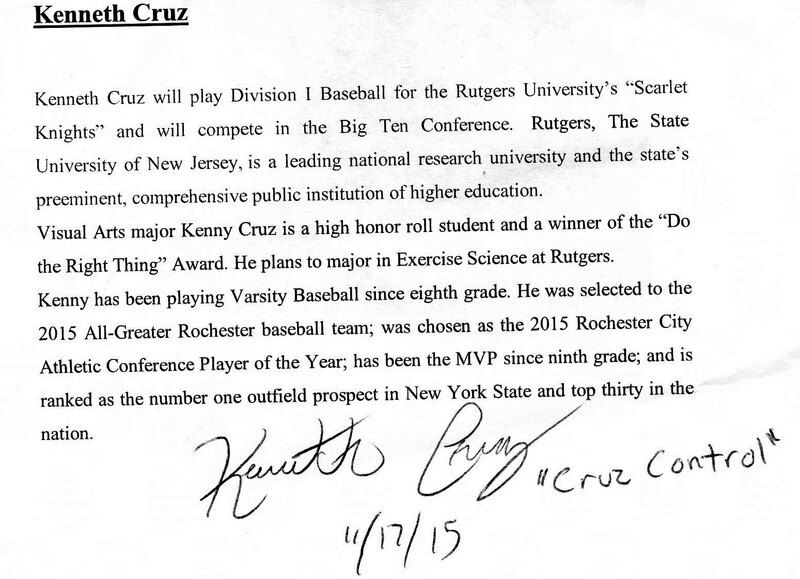 As seen in SOTA’s Kenny “Cruz Control:” from a Silverhawk to a Scarlet Knight, Talker christened Kenny as Cruz Control. At his signing day ceremony at SOTA, I asked Kenny if he had a nickname. Not really. “Babe” was taken, so Cruz Control it was. 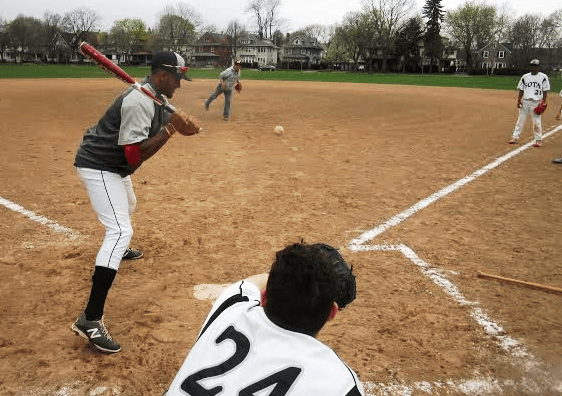 The nickname was headlined again in City baseball opens defending champion East’s Coach Crandall previews season and Cruz Control is back. So imagine my pleasant surprise when Kenny mentioned that Bill Pucko’s “Sports Beat” had called him Cruz Control, the title of its piece, as seen at 7:11 on the link (5/21/16). While heartening that the nickname is gaining steam, at the same time, Bill’s tone perhaps suggested that he or the reporter were coining the nickname for the first time. So perhaps next time, Bill, kindly mention that Cruz Control was first heard here on Talker of the Town. 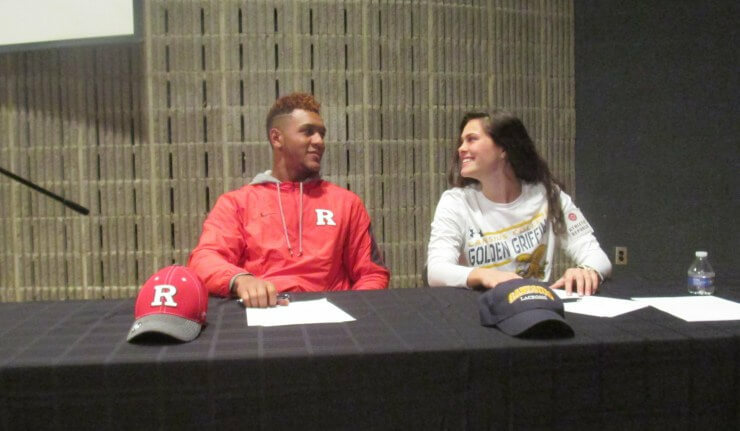 Oh, Kenny’s long time girlfriend Emma Myrglod also had a great softball season. 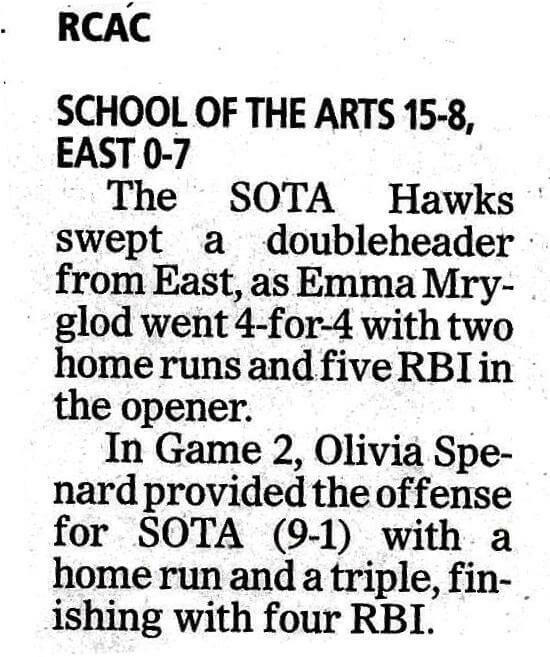 This D & C game summary was one of several featuring Emma’s exploits. Kenny was quick to say that Emma is a better softball player than he is at baseball. With instincts like that, the kid is going to go far. Congratulations East on a magical season. So Jefferson and Rocky DiPonzio’s 1980 mark still stands.